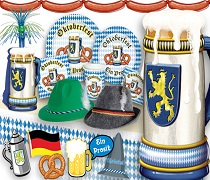 It is time to celebrate our German Heritage with this huge selection of Oktoberfest Party Supplies and decorations. Oktoberfest is a time to throw on those Alpine hats and hope in some Lederhosen all while drinking a large Bier. 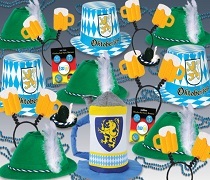 So get your party started by decorating with all of the bulk Oktoberfest party supplies available from Party Express. You can never have too much beer at any party. Add the Beer Mug Super Hi-Hat to your next event. Whether it's St. Patrick's Day or Oktoberfest, this beer mug super hi-hat will go well with the drinking feast. This party favor is a one size fits most. Each inexpensive hat stands 10 inches tall. It's unique design includes a pop-out handle. Check out all the other great items for your Oktoberfest. 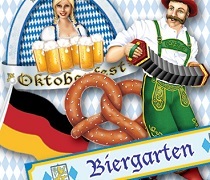 It's time to head over to the Bier Garten and start celebrating Oktoberfest. So grab your Oktoberfest Hats and costume accessories and be the star of the party! When you finally get your beverage of choice be sure to sit down at a fully decorated table that utilized our beer stein centerpieces and blue and white checkered Oktoberfest Table covers. It's time to enjoy some Bratwurst, Schnitzel, and Sauerbraten on our Oktoberfest paper plates and napkins. Most of our Oktoberfest decorations are the iconic blue and white checkered designs. However, if you would like to be more traditional this German holiday, then you can select from a large selection of Black, Red, and gold German party supplies. 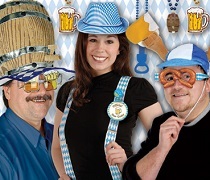 Whether you are hold a beer tasting event or hosting a yodeling contest you will be able to find all of the deeply discounted bulk Oktoberfest party supplies that you need for your event right here at PartyExpress.com.